As I mentioned in the Books section of the site, I love to read. I read a ton as a kid, but that diminished quite a bit as an adult. Over the past few years, I’ve started reading more, including 52 books in 2017. This change is due in part to the unprecedented access to books that we now have, thanks mostly to the rise of Amazon, ebooks, and good ebook readers, but also to me finally getting my own library card *and* using it—wearing it out, if we’re being completely honest. Speaking of the library: after sharing Julie’s library card for several years, using it to access ebooks, and now with my own card in hand, I finally took full advantage of what the library offered, and started placing holds on physical books (I even successfully requested a book not already in their catalog). 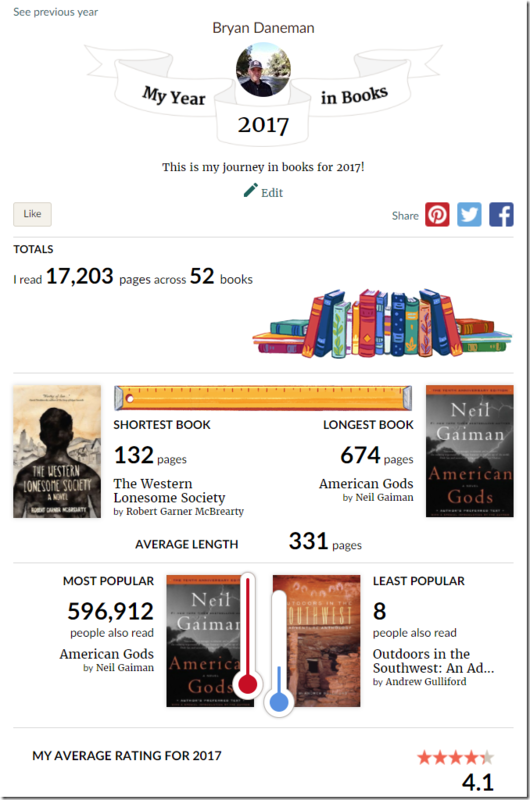 There’s probably one other component responsible for the uptick in how much I read, and that’s the use of Goodreads (if you want to change something, start measuring it). To further encourage reading, I’ve participated in the Goodreads Reading Challenge the past couple of years, and my goal for 2017 was 52 books, which you already know I hit, seconds before midnight on New Year’s Eve (a signed copy of Andy Weir’s Artemis FTW!). Due to logging what I read in Goodreads, I am able to present to you my 2017 Year in Books. I read a ton of fiction, mostly science-fiction, with a fair amount of non-fiction sprinkled in. I don’t typically force myself to continue reading a book I’m not enjoying, so there’s not a book on this list that I didn’t enjoy, and most books I enjoyed immensely. I’d love to hear about what you’ve been reading—I can never have too many book recommendations!